It’s gonna be…MAY! Join Ride for Reading for some exciting Events & Volunteer opportunities! Join us on May 2nd at First Tennessee Park for a Nashville Sounds baseball game! We are excited to announce that Ride for Reading has been selected as the Charity of the Game! More details can be found HERE. May 2nd is also The Big Payback a community-wide, 24-hour online giving challenge hosted by The Community Foundation of Middle TN. Make a donation to Ride for Reading between 6-9pm on May 2nd HERE. MOAB Bike Shop has teamed up with Ride for Reading to celebrate a unique cycling experience. This Gravel/Dirt Fondo is for all levels of cyclists. We want to create a festival atmosphere to welcome all riders to the rapidly growing trend of gravel grinding. There would be no Gravel Revival without the abundant chert/dirt roads of Hickman County. Take a step back in time to experience the varied terrain, from smooth, hard-packed dirt to narrow, rocky MTB-worthy surfaces. Join us on this special Cinco de Mayo weekend for camping, fun activities, well-marked routes, delicious local food, bike demos and entertainment. All proceeds benefit Ride for Reading and our mission to deliver more books to children from low-income areas, on our bicycles! More details HERE. National Ride For Reading Week is an annual nationwide effort in which volunteer cyclists bring our mission to their town by hosting book deliveries to Title 1 Schools in their communities. It’s the biggest week of the year! May is National Bike Month, and we hope to encourage cyclists to use a Ride For Reading delivery as part of their local celebrations. The 2019 dates for National Ride for Reading Week are May 5-11, 2019. Currently, 17 cities are confirmed across the U.S. to host Ride for Reading deliveries. This is also our Annual Giving Campaign and we invite you to help us continue our mission of bringing more books to children in low-income communities by bicycle by donating to Ride for Reading at: www.rideforreading.org/donate. Learn more about National Ride for Reading Week HERE. We invite you to register to join us for our May book delivery to Fall-Hamilton Elementary School on Friday, May 10th from 12:00pm – 2:30pm in Nashville, TN! Location meet-up: Sevier Park Community Center (3021 Lealand Lane). This delivery will be held during our National Ride for Reading Week and will be our biggest delivery of the year! Our goal is to have over 50 volunteer cyclists and readers joining us. We encourage you to invite your family, friends or a group of your colleagues to join you! We hope you will join us in making a difference by delivering books to the children at Fall-Hamilton Elementary by bicycle. Get that bike ready, load up some books and join us for an experience you will never forget- and neither will the children you serve! All levels of cyclists and volunteer readers are welcome. Click HERE to learn more. Ride for Reading kicks off the 2019 delivery year celebrating Dr. Seuss’ birthday! Join us for our FIRST book delivery of 2019 to the 640+ children at Smith Springs Elementary School in Antioch, TN on Friday, March 1st. We will meet at Smith Springs Community Center (2801 Smith Springs Rd.) at 12:00pm. We’re kicking off the delivery season on the weekend of Dr. Seuss’ B-day and National Read Across America Day so come dressed as your favorite Dr. Seuss character! Light snacks, drinks and cupcakes will be provided. VOLUNTEER CYCLISTS & READERS NEEDED! According to the Handbook of Early Literacy Research, the ratio of books per child in low-income neighborhoods is 1 age-appropriate book for every 300 children. 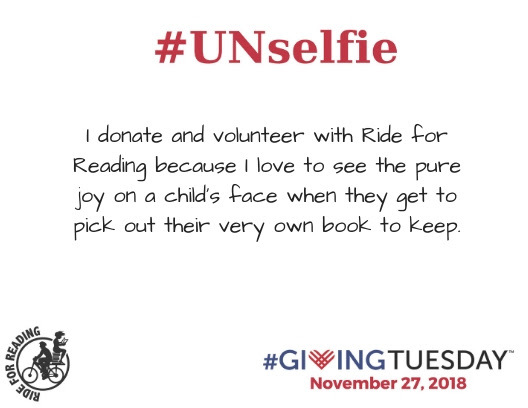 Ride for Reading’s mission is to promote literacy-readiness and healthy-living by delivering age appropriate books to children in low-income communities, by bicycle. Since 2008, we have mobilized over 20,000 volunteers to deliver over 500,000 books to over 300 schools in over 50 cities across the U.S. Founded here locally in Nashville, we host 8-9 book deliveries during the school year, to Title 1 schools. Additionally, we partner with Community Centers and Summer School programs and other Literacy Partners during the summer months to deliver books. Ride for Reading believes that education is not only found within the four walls of a school building, but within the pages of a book you can go anywhere, see anything, and experience everything. Every child deservs that despite economic status. Volunteers are the core of our mission and we couldn’t do what we do without the help of the community! We are in the need of volunteer CYCLISTS and READERS on an ongoing basis to join us on our book deliveries March – November to deliver 1,000+ books by bicycle to some very excited children! The book delivery consists of volunteers gathering at a Meet-up location to load up books in backpacks, trailers, etc. and riding our bikes together as a group (parade-style) to the School where hundreds of children welcome our volunteers with cheers, smiles, high-fives and hugs! We will share with the children the importance of literacy-readiness and healthy-living through activities like cycling. Volunteers will have the opportunity to interact with the students as they are picking out their books! The delivery route will be no more than 2-5 miles and relatively flat. The delivery will last approximately 2-2.5 hours, so please plan accordingly. We understand many of you are sacrificing your lunches and personal time, so thank you in advance! Please bring your own bike. All levels of cyclists welcome! If you do not have a bike, many local bike shops offer bike rentals. Please bring a backpack to carry your books in and everyone must wear a helmet (we have a few spare backpacks/helmets to lend). On each delivery, we are also looking for volunteers to read a book to the pre-K, K and 1st grade classes. If you do not want to ride a bike and would just like to volunteer as a reader, you can meet us to gather some books to take with you and then follow us to the school. Cyclists are welcome to register for both options. We are excited to share the love of reading (literacy-readiness) & cycling (healthy-living) with these children. We promise, you will never forget the experience of 300-600+ children excited to see so many people from their community bringing them their very own books! The more the merrier- invite your friends, family, co-workers & work teams, bike club members and someone you know that has never experienced a delivery before & join us to impact the lives of several children in our Community. Thank you all for volunteering your time with Ride for Reading! We’re dedicating this month to our Volunteers! As Ride for Reading prepares for another year of Book Deliveries, we want to invite you to a MLK Day of Service volunteer opportunity at our Ride for Reading Warehouse on Monday, January 21st between 10am-5pm. More details HERE. Click below to register to volunteer during a time slot. Light snacks and beverages will be provided. VOLUNTEERS are the core of our organization. Over 250 volunteers donated their time on our Book Deliveries and/or at our Fundraising events, Sorting Books, Collecting Books and/or Hosting Book Drives here in Nashville in 2018. With the support of our volunteers, Ride for Reading was able to deliver over 8,000 books to over 3,000 children in the Nashville area. We could not do what we do without our volunteers and we want to take a moment to celebrate YOU and all that you’ve done to help us accomplish our mission this year, to get more books into children’s hands. Thank you for allowing us to “Continue the Cycle” from year to year! Volunteer gifts, Awards & Recognition, DJ, and free food and beverages will be provided. Please register below if you are attending so we are able to plan for food & drinks! We’re excited to partner with Primal Wear, Inc. for our 2019 Ride for Reading gear! Men’s/Women’s moisture-wicking Henley Jerseys (perfect for those casual rides or running errands) Features: 2 Button Collar, Rear Zippered Side Pocket, Lightweight Echofe fabric, Side Split Seam. Features: Flatlock #13 – Galaxy, 2 Front Hand Pockets, 5C Exposed YKK Zipper, Sleeve Zipper Pocket, Gravity Melange fabric. Online store is only open until December 19th. Orders will be shipped by February 8th. Click below to place your order today while supplies last. *A portion of proceeds from each sale will benefit Ride for Reading! Ride for Reading delivers their 500,000 book! Since 2008, Ride for Reading has delivered thousands of books to children in low-income communities by bicycle every year to promote literacy and healthy-living. On October 11, 2018 in Nashville, TN, Ride for Reading delivered their 500,000 book to Noah at Buena Vista Elementary! And this wasn’t just any book, this was a special book written by a special friend, Steve Domahidy & illustrated by Rob Art Illustration! A Bike For You is a children’s book about bicycles and the animals that ride them! It encourages children to figure out which bike is right for them and to explore the world! It began as a kickstarter campaign and was first released on audio, narrated by Phil Liggett and Paul Sherwen, voices of the Le Tour de France. Along with audio, it is now available in paperback and a percentage of the proceeds will be generously donated to Ride for Reading! **If you would like to carry this book to sell at your bike shop, business, library, bookstore, etc. – send us a message at: info@rideforreading.org. For all media stories, please contact our Director, brenda.mikec@rideforreading.org. Order your copy now by clicking button below. It will make a great gift for that special child in your life! School’s back in and that means Ride for Reading is getting ready for our Fall Book Deliveries! We are seeking volunteer READERS and RIDERS! More details and a link to register can be found HERE. We couldn’t do this without our volunteers & community supporters – thank you for your support! School may have been out, but reading books & riding bikes was IN! Ride for Reading had the pleasure of partnering with some amazing Community Organizations for our Summer Book Deliveries! In July we partnered with Front Porch Ministry and The Salvation Army: Magness-Potter Center in East Nashville. 13 volunteers gathered at Von Elrods to deliver over 300 books to approximately 100 children that attend the Community Center during the Summer. Front Porch and the Salvation Army have both built many relationships with the children and families in this area and we were so excited to share the love of reading & cycling with them! In August we partnered with Metro Parks and Recreation, McFerrin Community Center, Green Fleet Bikes, Nashville Public Library, Front Porch Ministry and a special guest appearance from The Nashville Sounds‘ “Booster“ (who rode a bike right along with us! ), in East Nashville. Over 30 volunteers gathered at Green Fleet Bikes to deliver over 300 books to approximately 100 children that attend the McFerrin Community Center during the Summer. Carlos Cook, Manager, has nurtured many relationships with the children and families in this area and we were so excited to partner together and share the love of reading & cycling with them! Additionally, our very own Metro Parks Police and Metro Nashville Police Department showed their support by riding and protecting the riders! And we can’t forget our special partner, King of Pops, who generously donated popsicles for the children on those hot summer days! THANK YOU to everyone that helped make our Summer Book Deliveries a huge success!! If you would like to join us on our upcoming deliveries, we invite you to learn more HERE! Save the dates – more details coming soon!